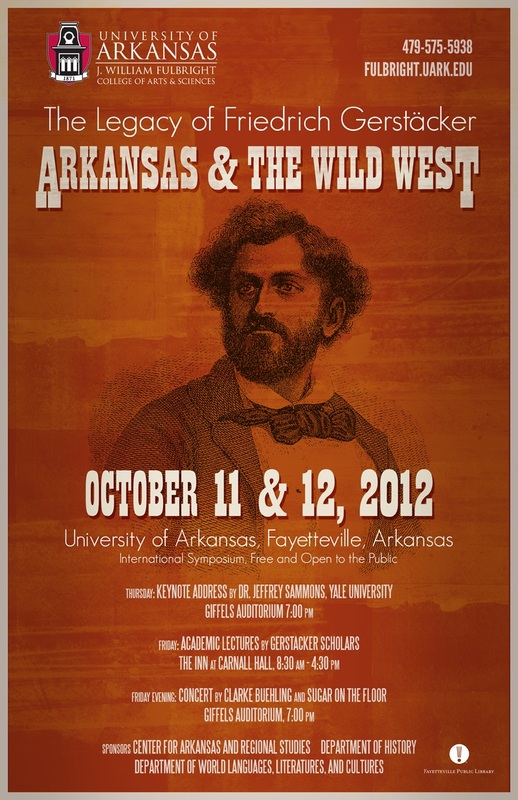 The University of Arkansas conference on The Legacy of Friedrich Gerstäcker: Arkansas and the Wild West provided several scholarly perspectives on his work as a writer of adventure stories and travelogues. It included a keynote lecture, ten papers by literary scholars and historians, and a visit to some sites in the Ozarks that Gerstäcker visited in the early 1840s. Gerstäcker's travels in Arkansas are described in his book, Streif- und Jagdzuege durch die Vereinigten Staaten Nord-Amerikas (in English the title is Wild Sports in the Far West), published in Germany in 1844. In this book, Gerstäcker described, among the other things he did during his visit to the United States from November 1837 to July 1843, his two years in Arkansas. During his time in Arkansas, he met and befriended many German immigrants living in Little Rock, Perry County, and elsewhere. Gerstäcker's experiences and observations in Arkansas provided material for several of his novels and short stories. 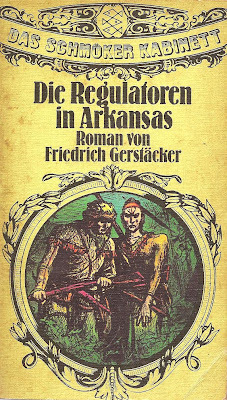 For example, his 1846 novel, Die Regulatoren in Arkansas: Aus Dem Waldleben Amerikas (The Regulators of Arkansas), is set in and around Perry County. A good sample of his short stories set in Arkansas can be found in the 1991 book, In the Arkansas Backwoods: Tales and Sketches by Friedrich Gerstäcker, edited and translated by James William Miller. From my perspective, Gerstäcker is a valuable historical resource for understanding how people lived in Arkansas in the late 1830s and early 1840s, and he provided valuable insights into the lives of early immigrants into the state. His descriptions and stories enliven and illuminate the early years of the state. 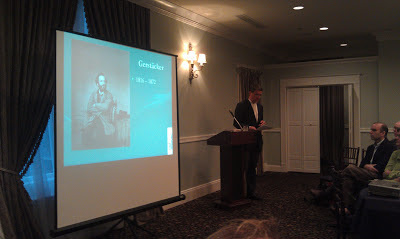 A good portion of this conference was less about the value of Gerstäcker as a source for understanding Arkansas history and more about him as an important literary figure in Germany. 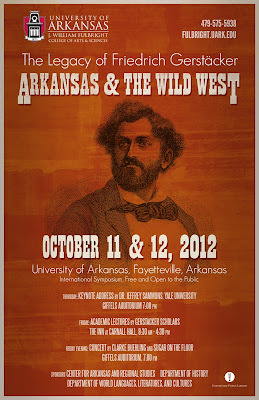 The conference papers focused mainly on him as a writer rather than on his contributions to Arkansas history. The keynote lecture, on Thursday night, October 11th, by Jeffrey Sammons, Leavenworth Professor Emeritus of German Language and Literature at Yale University, discussed Gerstäcker as a preeminent author of adventure novels. According to Sammons, adventure novels were very popular in the 1840s and 1850s because stories of Indians and bandits helped enliven boring lives and regimented work of the times. 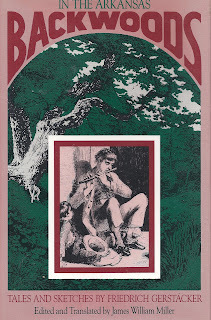 Gerstäcker’s books were very popular in Germany, especially with juveniles. They served to introduce the American continent to Germans and, when translated, German-Americans to readers in the United States. Sammon’s plea was that Gerstäcker be taken more seriously in Germany as a author of first rank, not just a specialized writer of adventure books for juveniles. Most of the papers of the conference on Friday, Oct. 12th, continued a literary analysis of Gerstäcker’s work as an author. 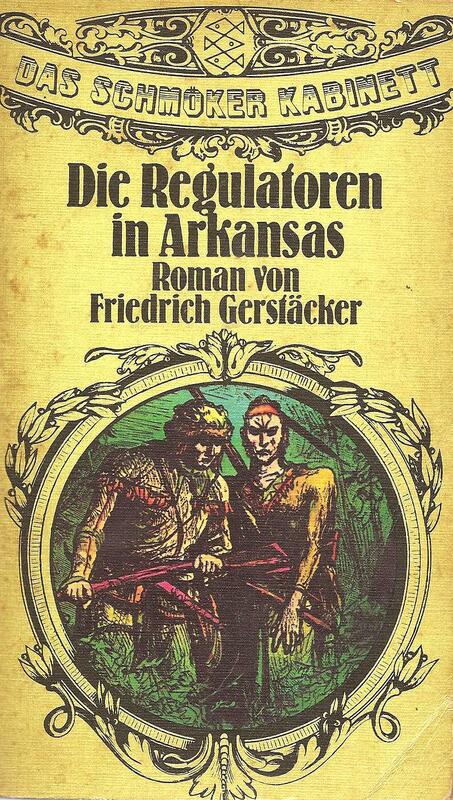 Wolfgang Hochbruck (American Studies, University of Freiburg) explored some influences on two of Gerstäcker’s adventure novels, The Regulators of Arkansas and Flusspiraten des Mississippi (Mississippi Pirates). In his paper, "River Pirates and Leather Stockings: Gerstäcker and the Adventure Novel", Hochbruck suggested that the two books were inspired by stories about John Murrell and his notorious gang. Also, he traced the influence of James Fenimore Cooper and other American adventure writers on Gerstäcker. Charles Adams (Department of English, University of Arkansas) and Christoph Irmscher (Department of English, Indiana University) began their presentation with some good news: together they are preparing a new translation of Die Regulatoren in Arkansas. They have a contract with a publisher and the manuscript is due in January 2014. They noted that no good translation of the novel is readily available in print or out-of-print. This new translation will make this novel, based on frontier life in Arkansas, easily available in English for the first time. Because I am more interested in history than in literary studies, I especially enjoyed the paper by Michael Pierce, a labor historian at the University of Arkansas, with the title "C. O. Haller and the Rise of Negrophobia among Gerstäcker’s Arkansas Friends." The focus of the paper is Charles Haller, one of the early German pioneers that Gerstäcker encountered during his first visits to Little Rock and Perry County. When Gerstäcker returned to Arkansas in the late 1860s, after the end of the Civil War, he was saddened to learn that Haller was dead. Pierce suggested that because many Germans in Arkansas were skilled laborers, plus because of other factors, they had attitudes toward slavery and Negroes that differed greatly from those of Germans in Missouri. In Arkansas, Pierce maintained, German immigrants supported slavery and secession, and they willingly fought on the Confederate side of the war. In all, the conference provided an intellectually rich experience with the opportunity to learn from the research of a broad range of international scholars. Did they finish that translation of The Regulators of Arkansas? Good question. I cannot find any evidence that the book, which they were supposed to finish in January 2014, has been published.